Classic-Castle.com • View topic - LCC-Garheim Angus braves the storm. LCC-Garheim Angus braves the storm. Angus and his squire Erik were out hunting with a bearhound when a blizzard burst upon them. They quickly erected a hut from branches and saplings to try to hold out against the elements. Re: LCC-Garheim Angus braves the storm. The snowdrifts look great. Nice job! Also like that you made a point to make the flags blow out in the wind. Simple detail that adds a lot. Very cool! Nice lighting effects! Great work on the blown snow! Nice use of the carpet! Great job! It feels cold just looking at it, I think I'll have to up my thermostat now. I do wish we could see what's happening inside, good to see you used a 'light up' brick for your fire but I was hoping to see how you used it inside. Good job all around.. Very inspiring! Canoehead wrote: Great job! It feels cold just looking at it, I think I'll have to up my thermostat now. The partially pressed tiles are great, as are all of the snow effects. 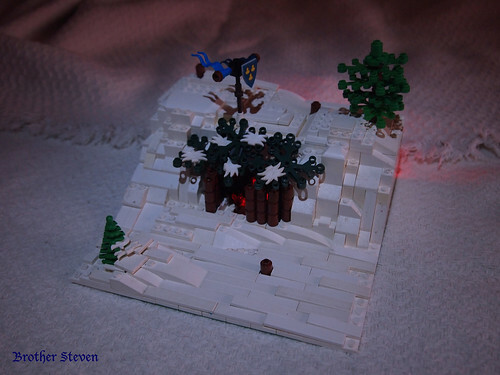 This is one of the most realistic snow MOCs I've seen. Great job. I really liked the "Natives" headdress piece that you used for the snow, especially in the tree on the left. You sure set a high standard with this, Steven. You can really tell which way the wind is blowing, and created a great effect. Looks cold . It's very well made MOC, congratulations!